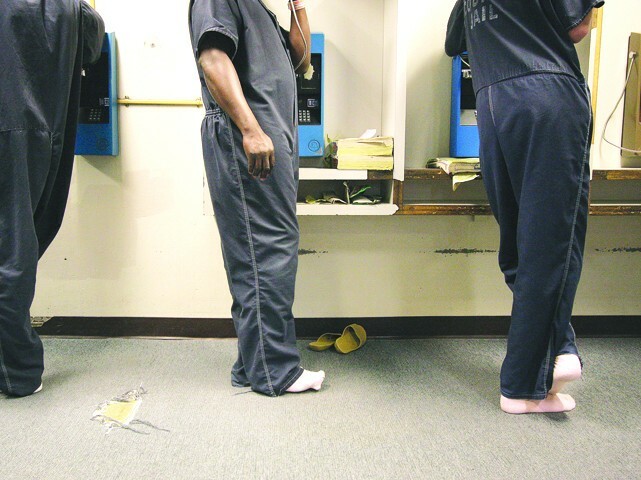 Three-East in the Spokane County Jail: Men in dark jumpsuits and pink socks hang around, sitting at tables, clustered in corners and glued to the bank of six phones, their connection to the outside. Inside one of the floor’s dorms, a few more men recline on their beds, reading paperbacks. It’s noisy and cramped, guarded over by a handful of deputies, and the stares aren’t shy. This half-floor is packed, stuffed beyond its intended capacity of 46 inmates. Today, it holds 58. Up a floor, on Four-East, the scene is much quieter. A single deputy sits alone. There’s not enough jail staff on the clock, so his module’s inmates are in lock-down. Still, even if Four-East’s residents were out, it’d be a different story. This is the jail’s mental health wing, and there are only 12 people here, on a floor also capable of holding 46 inmates. “We don’t have many options on where we can place these people. We either have to put them under maximum security or in Four-East … or in the general population under medication,” says Lt. Dan Veloski, who oversees the medical and mental health units at the jail. The different situations on the floors highlight a few of the jail’s many problems. First, it’s just not big enough to fit all the inmates. Built in 1986, the jail was supposed to last decades, but it was overcrowded within 10 years. Today, the jail that was supposed to max out at 472 inmates regularly holds close to 700. Second, the jail wasn’t made to be a mental health institution, but now it has to be. Two-thirds of its population has mental health issues. A year ago, the jail was officially designated as a mental health provider and, according to Sheriff Ozzie Knezovich, it’s the second-largest mental health institution in the state. Finally, thanks to the county’s shrinking budget, there aren’t enough staff members to watch all the incarcerated people. “We just need a bigger jail,” Veloski says. This month, Spokane County commissioners will make a final decision on where to build an expanded jail. On top of the downtown jail being packed, the minimum-security annex of the jail, Geiger Corrections Center, is to be shuttered in 2013 by request of the airport, which owns the land. Geiger was never meant to house criminals — it was built for military barracks in World War II — and no one questions the need for new jail space. The commissioners, therefore, have three choices: expand the current jail downtown, build one on a gravel pit north of Airway Heights, or build one near Medical Lake. The costs range from $229 million to $265 million for the first phase, and a myriad of factors are going into the decision-making process. Two years ago, David Bennett, a consultant who works with criminal justice systems across the nation, delivered the results of his six-month, $116,000 study looking into the jail and Spokane’s judicial system as a whole. By getting charges filed within the lawfully mandated 72 hours and through greater cooperation among the area’s courts, Bennett has guided the jail expansion down a smaller-scoped and less costly route. Where his original estimate pegged the jail as needing 60 new beds per year, Bennett now says it needs just 40 a year. This new estimate, a total of 250 fewer beds, could save the project up to $26 million and is guiding the expansion’s path. But Bennett says there’s one issue that has yet to be resolved. Back on Four-East, the mental health wing, Deputy Greg Gooch says he deals with “schizophrenia. A lot of schizophrenia.” But, unlike the unpredictable behavior of schizophrenics, the floor’s typical day sounds downright banal. It begins at 8:30 with The Today Show. At 10, The Price is Right. Lunch, then, at 1:30, Scrubs. Bingo games used to be a regular activity, with the healthier patients helping to divvy up the prizes of soap and candy bars. Many blame the “deinstitutionalization” of the 1970s (which replaced long-term, state-run psychiatric hospitals with community health programs) for today’s large share of mentally ill inmates. In the opinion of many people, the shuttering of state hospitals led to sick people being pushed to the street, uncared for and forgotten. But David Panken, executive director of Spokane Mental Health, says this doesn’t give the full picture. Funding dried up, much like what is occurring today. No one interviewed for this article was willing to estimate how much money was needed to fully fund the region’s mental health programs and institutions. However, some were willing to talk about the effect of such a thing happening. Veloski, the jail’s medical lieutenant, estimates the inmate population would drop by 20 percent if the community had an intact safety net for the mentally ill.
Sheriff Knezovich says this estimate is conservative. Ray, who runs the jail’s mental health department, says a majority of her work is in crisis treatment. She sees inmates who are brought in and are “severely mentally ill. Those that are psychotic. They don’t know who they are and have been picked up for malicious mischief.” She spends every morning doing suicide assessments. Regardless, she says it’s the jail’s duty to help these people, if for no other reason than public safety.